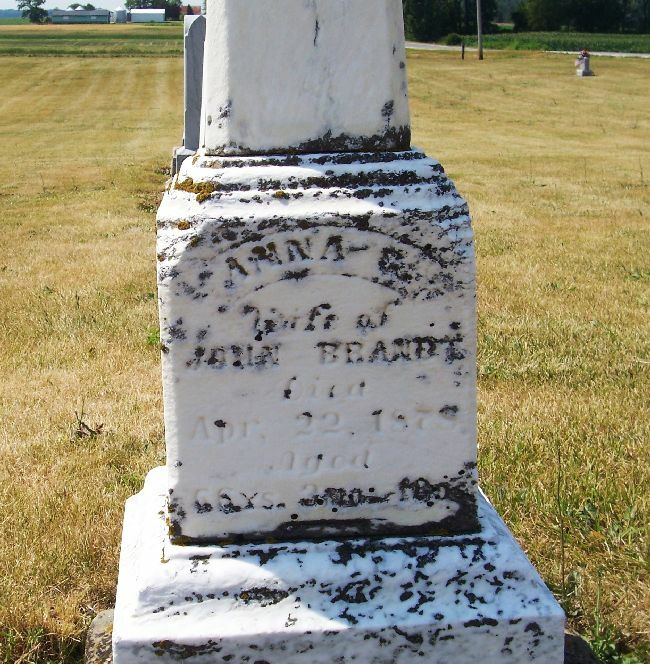 John & Anna C. Brandt, Duck Creek Cemetery, Blackcreek Township, Mercer County, Ohio. 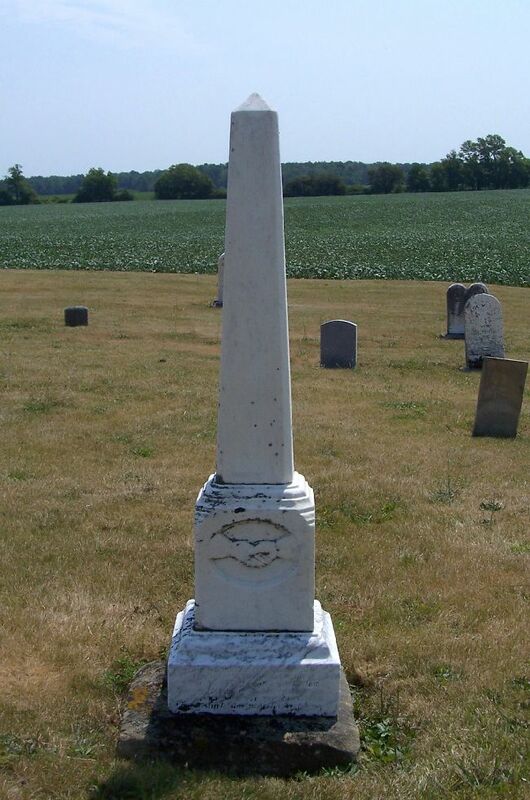 This is the tombstone of John and Anna C. Brandt, located in row 8 of Duck Creek Cemetery, Blackcreek Township, Mercer County, Ohio. 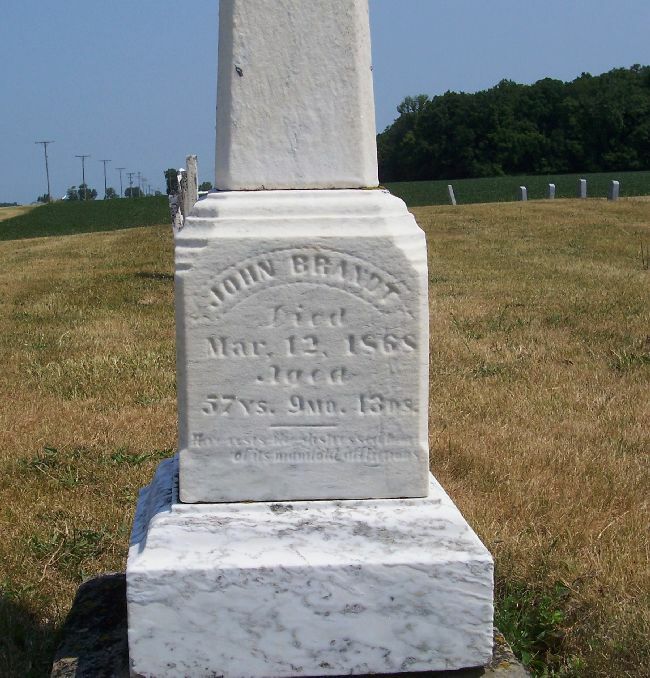 The marker is inscribed [south side]: John Brandt Died Mar. 12, 1868, Aged 57 ys, 9 mo, 13 ds. [north side]: Anna C., Wife of John Brandt Died Apr. 22, 1878, Aged 66 ys, 3mo, 10 ds. Anna’s death is recorded in records of Zion Lutheran, Chattanooga, but John’s death is not. According to the Familienbuch portion of the records of Zion, Johannes Brandt was born to [father’s name not entered] and Maria Brandt on 19 May 1810 in Dietzhausen by Suhl, District Schleusingen, Kingdom of Prussia, Europe. He was baptized and confirmed there. When he was 22 years old he married Anna Catharina Geisenhoner, the daughter of Matthaus and Sophia Geisenhoner. She was born 12 January 1812 in Schmeheim, County Court Roenfeld, Dukedom Meiningen. She was baptized and confirmed there. The couple traveled to North America in 1855 and settled down in Blackcreek Township, Mercer County, Ohio. Johann Casper, born 26 August 1833 in Dietzhausen (the birthplace of his father), where he was baptized and confirmed. Maria Catharina, born 5 March 1836 in Dietzhausen, where she was baptized and confirmed. Ludwig, born 30 November 1839 in Dietzhausen, where he was baptized and confirmed. Maria Louisa, born 10 April 1843 in Dietzhausen, where she was baptized. She was confirmed in St. Marys, Auglaize County, Ohio, by J. Bundenthal, the Evangelical Lutheral pastor. John and Anna’s daughter Maria Catherina married Wilhelm August. Son Ludwig Brandt married Margaretha Haffner on 10 June 1866 at Zion. Ludwig & Margaretha’s son Romeo Brandt was featured in last week’s Tombstone Tuesday. Daughter Louisa Brandt married William Wirwille on 30 November 1865 at Zion. John Brandt (1810-1868). South side of marker. Anna C. Brandt (1812-1878). North side of marker. 1. Mathäus, Gastwirt, Pachtmüller, Vorsteher, Metzger Geißenhöner wurde 1774 in Schmeh. geboren. Er war der Sohn von Johann, Caspar, Mitnachbar, Ackermann Geißenhöner und Anna, Margaretha Geißenhöner, geb. Geißenhöner . Er heiratete Sophie, Elisabeth Geißenhöner, geb. Kälber , geboren um 1780 in Lengfeld , verstorben 30.11.1845 in Dietzh. , Tochter von Christoph, Müller Kälber und Eva, Margaretha Kälber, geb. Köhler . Er starb am 18.11.1829 in Schmeh. .
5. Anna, Catharina Brandt, geb. Geißenhöner wurde am 22.01.1810 in Schmeh. geboren. Sie war die Tochter von Mathäus, Gastwirt, Pachtmüller, Vorsteher, Metzger Geißenhöner 1 und Sophie, Elisabeth Geißenhöner, geb. Kälber . Sie heiratete am 26.08.1832 Johannes, Webermeister Brandt , geboren 01.10.1787 in Dietzh. , verstorben 01.02.1852 in Dietzh. , Sohn von Johann, Caspar, Ackermann, Schäfer Brandt und Eva, Marie Brandt, geb. Kleffel . Sie starb am 20.05.1842 in Schmeh. .
Johannes, Webermeister Brandt und Anna, Catharina Brandt, geb. Geißenhöner hatten 5 Kinder. i. Johann, Caspar Brandt , geboren am 26.08.1833 in Dietzh. iii. Catharina, Maria Brandt , geboren am 05.03.1836 in Dietzh. iv. Joahnn, Ludwig Brandt , geboren am 29.11.1839 in Dietzh. v. Maria, Luise Brandt , geboren am 10.04.1842 in Dietzh.